Our commercial fleet fuel cards offer you the control and convenience you need to fuel your business and manage your fleet. We offer access to three different commercial fuel networks and provide detailed transaction information via our fuel reporting tools. We also offer complete card management capability via our Flyers proprietary customer portal. Fleet fuel card programs control expenses by reducing unauthorized fuel purchases. Every card is customized with driver and vehicle controls that allow you to determine when, where, and how much fuel can be purchased. Flyer’s selection of fuel card products ensures you will find a convenient fueling location nearby, with all transactions from all cards types consolidated in a single invoice. We are here for you around the clock by phone, email, chat, or text. No matter how you choose to work with us, you deserve the best customer service to manage your commercial fuel program. 24/7 online access to your account puts you in the driver’s seat. Order new cards, retrieve invoices, and gain control of your fleet’s data using our sophisticated, customizable reporting. Find out why 80% of our fleet fuel card customers choose the CFN card. Stay in the CFN network for the greatest savings. Over 2,500 locations plus the option to access the extended Fuelman network for a total of over 50,000 locations. Quick Fueling at high-flow, unattended cardlock sites for your larger vehicles. Video Surveillance at most CFN locations. 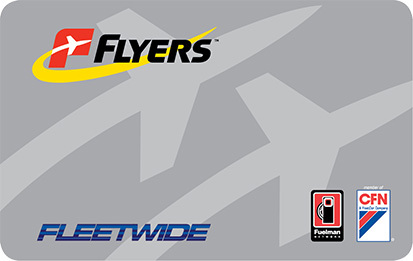 When convenience is most important, choose the Flyers Fleet Card. 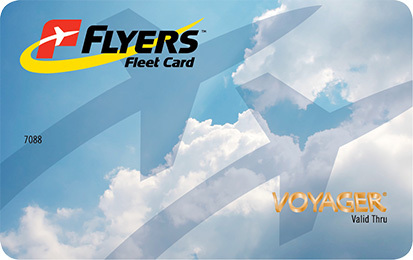 With more than 230,000 fuel and maintenance locations throughout the Voyager network, the Flyers Fleet Card gives you access to nearly every truck stop and gas station in the country. Access to 60,000 maintenance locations nationwide. Depending on your geographic location, the Pacific Pride network may offer the most convenient sites. Pacific Pride’s cardlock model offers customers the greatest savings when you fuel in network. Over 1,250 locations plus the option to access the extended Fuelman network for a total of over 50,000 locations. Video surveillance at most Pac Pride locations. Customers who stay in network have the greatest savings. Your surveillance video helped me identify a team member who was stealing fuel. [Your program] puts my mind at rest. What I appreciate most in our talks is you listened to us and our concerns in how we run our business, how we are planning our future, and how important our relationship and business is to you and your company. 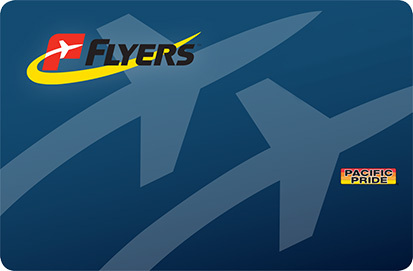 Flyers Customer Service is awesome! I can count on them to help me figure out whatever I need to do and make everything run smoother and safer.